In an earlier post I noted that not all the residents of the colonies wanted to break ties with Britain. Those who wanted to keep ties with Britain were called Loyalists. Given the persecution of American Citizens abroad, I have become interested in the lives of the Loyalists during the American Revolution. The truth is that the Patriots were NOT an overwhelming majority. In fact it is not clear who were the true patriots. Were those who opposed the British the patriots? Were those who supported the British the patriots? Who were the True Patriots? In fact, the early colonies came within one vote of agreeing to something close to the British North America Act. 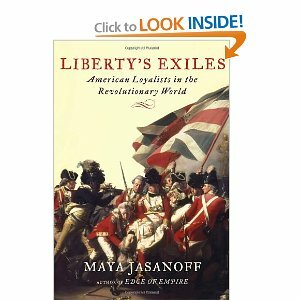 Would you like to have a Loyalist during the American Revolution? If you knew what they had to endure, the answer would be no. This entry was posted in U.S. democracy, U.S. freedom, Uncategorized and tagged FATCA, FBAR, Liberty's Exiles, Maya Jasonoff, OVDI on December 23, 2011 by renounceuscitizenship.